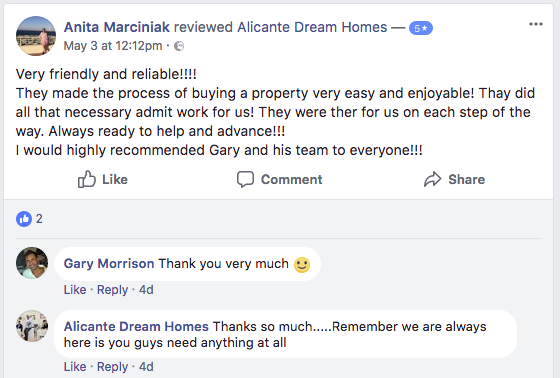 Joyce Hampson recommends Alicante Dream Homes. Thank you Gary for a job well done service was excellent always there to answer any questions very helpful, would definately recommend. 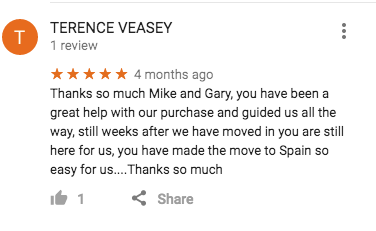 Thank you Mike and Gary for your professional services. We had more viewers when we signed up with you than with any of the other estate agents we'd used. You were always at the end of the phone whenever we needed you. Mike went over and above the necessities for selling our house. They provide a very professional service and add a nice personal touch. Mike is a very nice kind and patient man and helped us so much along the way. 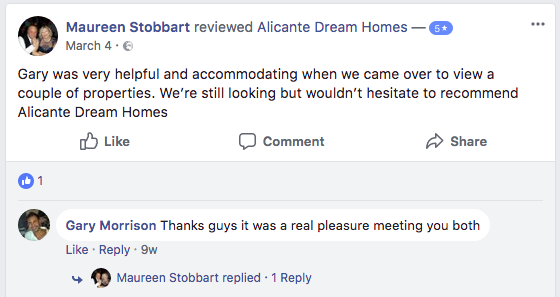 We would have no hesitation in recommending Alicante properties to anyone. Thanks very much for your help guys. They made the process of buying a property very easy and enjoyable! Thay did all that necessary admit work for us! They were ther for us on each step of the way. Always ready to help and advance!!! I would highly recommended Gary and his team to everyone!!! 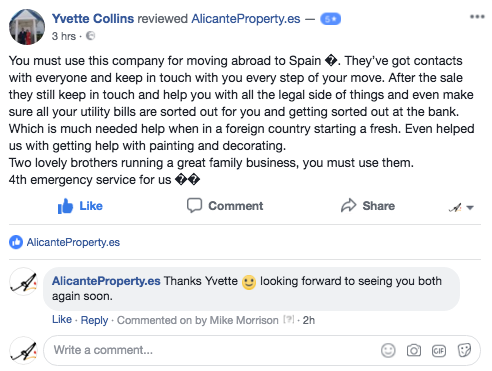 You must use this company for moving abroad to Spain. They’ve got contacts with everyone and keep in touch with you every step of your move. After the sale they still keep in touch and help you with all the legal side of things and even make sure all your utility bills are sorted out for you and getting sorted out at the bank. Which is much needed help when in a foreign country starting a fresh. Even helped us with getting help with painting and decorating. Two lovely brothers running a great family business, you must use them. 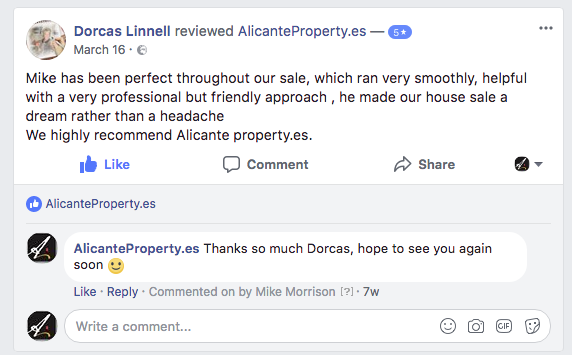 We highly recommend Alicante property.es. Mike Morrison and his team were fantastic. His patience, understanding, local knowledge, advice and commitment made this daunting experience very reassuring for myself and Paul. He took time to explain everything to us, as we moved step by step. He found us a property within a few days, ensuring that we completed without any problems. He introduced us to a local lawyer, as well as contractors. We would like to thank Mike and his team, you were all fantastic. 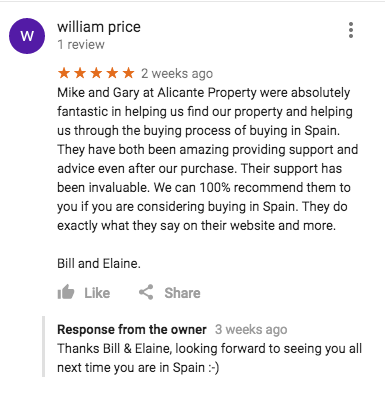 We will recommend Alicante Propertys to all our friends and family. & on Google click here.